Two vehicles have been struck by objects hurled from bridges in what appear to be copycat attacks. Both vehicles were travelling on the M8 in Scotland and comes only days after two similar incidents in the south of England. On Saturday at around 19:50, a car travelling along the M8 was struck on the roof after what is described as a large object was thrown from the B792 Blackburn to Bathgate bridge. And on Monday evening at 19:10 a van's windscreen was smashed after it was targeted in the same location. Police have appealed for witnesses and are warning drivers to be alert when driving under bridges. Insp Simon Bradshaw, of Lothian and Borders Police, described the incidents as "mindless vandalism" which could have resulted in "far more serious consequences." "The M8 is Scotland's busiest motorway, so these incidents could potentially have caused multiple fatalities," he said [BBC]. The attacks on the M8 come after similar attacks on the A12 in Essex. In those attacks one woman woman was seriously injured while another car driver escaped with minor injuries [BBC]. Essex police say they are treating the incidents as attempted murder and are looking into similar incidents over the past few years [Daily Mail]. While such attacks are rare, the recent spate of attacks will be alarming for those driving under bridges. No driver is immune from such attacks. 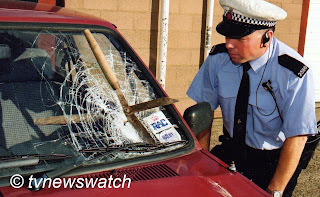 In 1997 the actor Sean Connery became the victim when his Range Rover was hit by a brick shattering his windscreen. The actor was in a state of shock but otherwise uninjured [Link]. There have been deaths resulting from such incidents. In 1985 two Welsh miners were jailed for murder after they were found guilty of throwing an 18 Kg concrete block from a bridge onto a taxi belonging to David Wilkie. While the attack was likely politically motivated given that Wilkie was driving a strike breaking miner to his workplace, the attack caused widespread revulsion. Dean Hancock and Russell Shankland were found guilty of murder but on appeal this was later reduced to manslaughter and their life sentences were replaced with eight-year prison terms [BBC]. Bricks and concrete are not the only objects that have been aimed at cars. 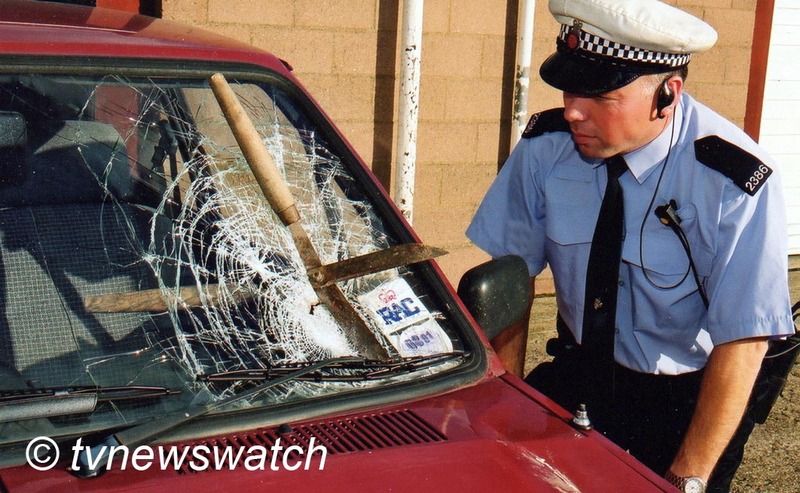 On the 30th September 2000 a 19-year-old female drive narrowly escaped serious injury after a pair of garden shears were thrown from a bridge on the A1089 in Essex and became embedded in her windscreen [pictured] [Link / Link].